Over 120 leaders in their fields are lined up as speakers. One of many highlights promises be the opening lecture by the dynamic tandem, Prof Dohmnall Macauley and Prof Karim Khan, BMJ/BJSM editors. Other keynote speakers and topics include Paul McCrory on concussion, Benno Nigg on running injuries, Evert Verhagen on how digital and mobile platforms will influence athlete care, Andrew McIntosh on technology and equipment in sport, Juan Manuel Alonso on hamstring injury prevention, Caroline Finch on injury surveillance and rule changes. 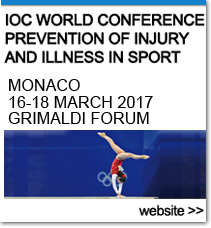 This triennial conference is a unique opportunity for the global sport and exercise medicine community to meet face to face in the ideal environment that Monaco provides. Click this link for the full 2nd announcement and listen a preview podcast with Roald Bahr here.